Garry Kimble scores the winner for Posh against Liverpool in December 1991. When Posh were drawn at home to Liverpool in the 1991-92 Rumbelows Cup, manager Chris Turner famously stated his team would only win if they boarded their own goal up and were allowed to start with 12 men. Bradford City players celebrate an FA Cup win at Chelsea in January, 2015. Can the current Posh crop repeat that feat? It’s unlikely, but you never know, especially if the following happens . . .
1) Luke McGee has a ‘worldie’ in the Posh goal. 2) The luck of the Irish descends on Grant McCann and Darragh MacAnthony. 3) The law of averages kicks in as Chelsea are due a home defeat. 4) Posh start with immense self-belief: Bradford City beat Chelsea at Stamford Bridge when they were sixth in League One and Jose Mourinho’s team were top of the Premier League so it can be done. 5) The 6,000 Posh fans will probably out-perform the 35,000 Chelsea fans. It could help. 6) Chelsea are too complacent. 7) Chelsea pick a weakened team with little experience of playing together. 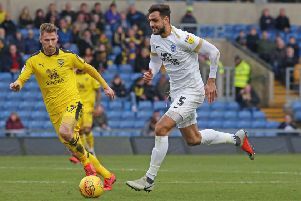 8) Posh captain Chris Forrester and teenage side-kick Leo Da Silva Lopes prove what a lot of people suspect, that they are Premier League players of the future. 9) Referee Kevin Friend gives every 50/50 decision in Posh’s favour. A big long shot this one. 10) Posh never give up. Chelsea led Bradford 2-0 two years ago and lost 4-2.